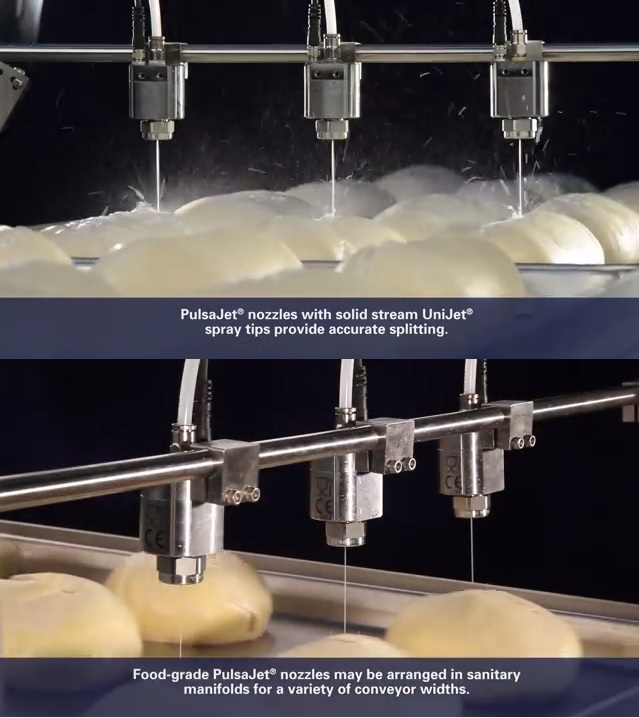 PulsaJet® nozzle equipped with solid stream UniJet® spray tips provide precise scoring of bread, rolls and more. Sprays are automatically adjusted to keep pace with line speed and can be easily adjusted for different products. Eliminate downtime caused by dough sticking to cutting blades and repairs to mechanical splitters by changing to PulsaJet® nozzles. Spraying Systems Co. is the global leader in spray technology. It has the broadest product range in the industry, ten manufacturing facilities and sales offices in more than 85 countries. Spray nozzles, turnkey spray systems, custom fabrication and research/testing services comprise the 70-year-old company’s offering. More information is available at www.spray.co.za or by contacting the company directly at (011) 618 3860 or by email grant@monitorspray.co.za.